Unionoid mussels have evolved an amazing variety of lures, baits, nets, and behaviors to attract host fish for their parasitic larvae. However, anecdotal accounts over the past few years suggested a perhaps even more surprising mechanism for host infestation- host capture by the female mussel. 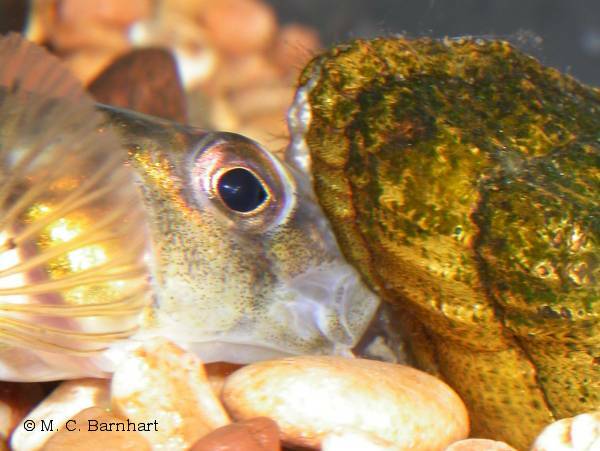 Renee Sherman-Mulcrone (University of Michigan) observed a snuffbox mussel (Epioblasma triquetra) clamped on the head of a logperch. Tony Brady (Tennessee Tech, now with USFWS, Genoa) observed a darter caught by an oyster mussel (E. capsaeformis). 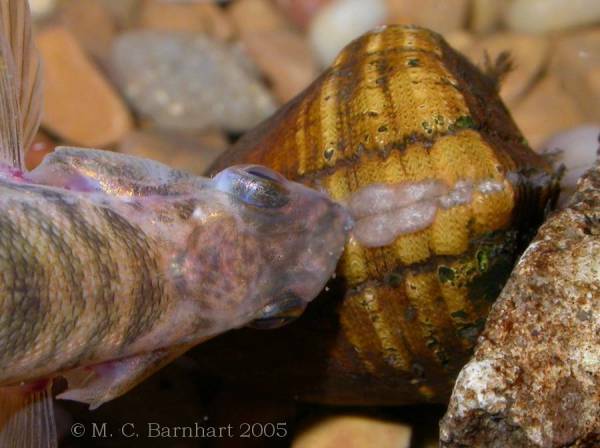 Jess Jones at Virginia Tech in his 2004 Master's thesis reported that female Epioblasma in the subgenus Torulosa quickly closed their shells when touched, and that this behavior might capture host fish and be a way of infesting the host with glochidia. Jess used the name "fish snapper" to describe this behavior. Bill Roston and I set out to test the hypothesis of host-capture in snuffbox mussel in the spring of 2004. We brought female mussels and host fish into aquaria and soon discovered that the anatomy and behavior of Epioblasma are adapted in several remarkable ways to capture host fish and infest them with glochidia. In 2005 we visited the Alleghany River and made similar observations on Northern riffleshell (E. torulosa rangiana). The photos and video clips below illustrate these adaptations, which were reported at the FMCS and AMS/WSM meetings in 2005. Click on the thumbnails for larger jpg images, and the text links for wmv videos. Snuffbox. The foreboding view at left is a female snuffbox brooding glochidia and "displaying" her mantle. Non-brooding females do not gape so widely. 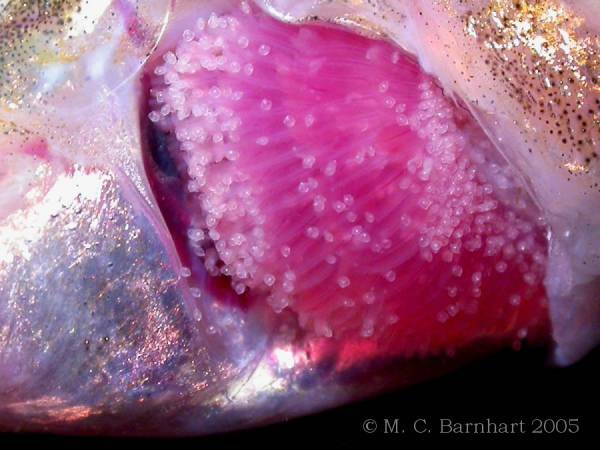 The central rows of ridges on the mantle may act as a lure for the host fish. 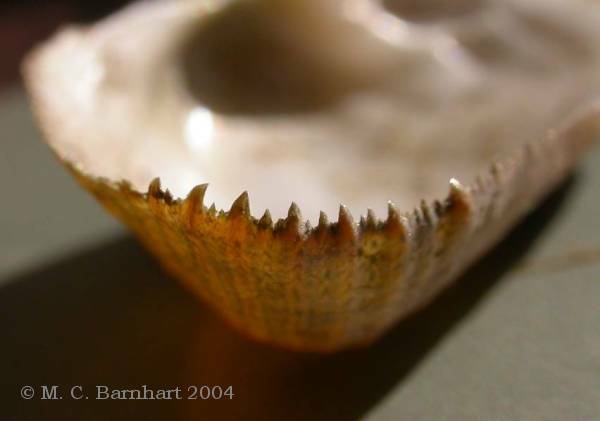 Also note the tooth-like serrated edges of the shell (see below). Displaying females are reluctant to close unless touched on the mantle, but then snap shut within 1/15 of a second. The primary confirmed fish host of snuffbox is logperch (Percina caprodes). Logperch forage by rolling stones with their slender but solid rostrum. They also roll mussels (video clip, 2 MB). This charming behavior increases the chance of capture by female snuffbox. The mussels continue to gape as they are rolled about. A "close encounter" between logperch & snuffbox. This video clip (4 MB), shows a capture. Most mussel-fish interactions are no more than mildly annoying for the host, but Epioblasma can kill. 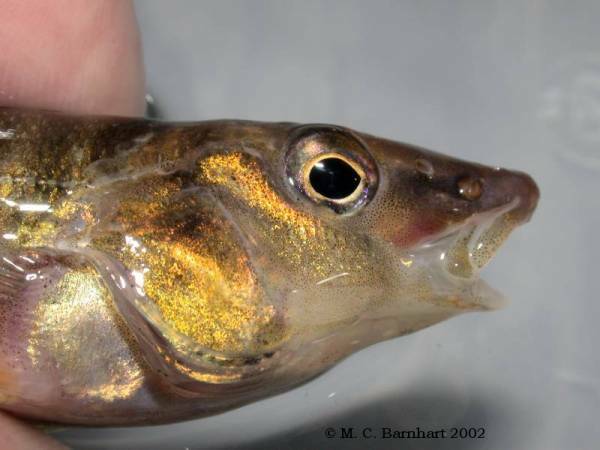 Snuffbox females easily crushed the head of Etheostoma darters, but logperch, with their reinforced snout, usually survived. Of course, a dead fish is of no use to the mussel (the glochidia require 2 weeks or more to transform). 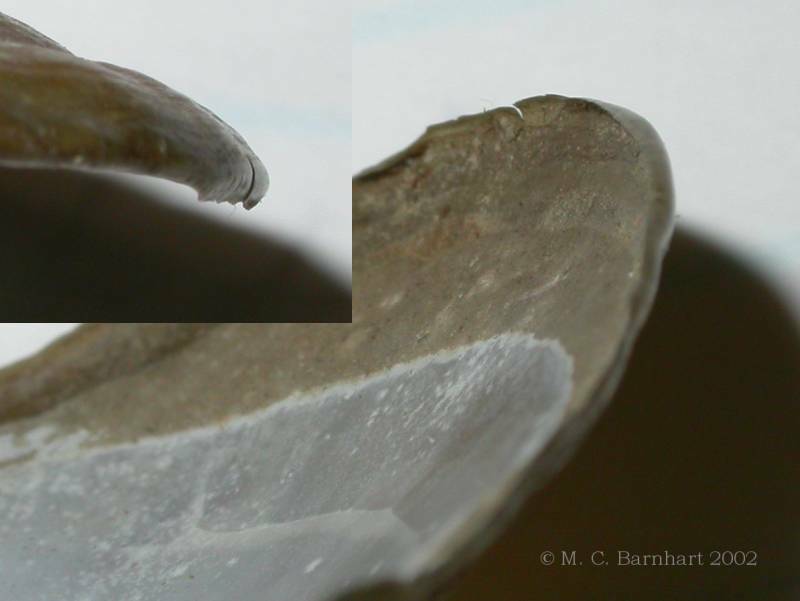 Recurved denticles on the posterior shell margin aid in holding the fish. These denticles appear only in the female mussels. Common names such as "combshell" and "catspaw" allude to the presence of these structures in other species of Epioblasma. A different edge modification is found in female Northern riffleshell (see below). Mantle gasket. Ortmann (1911) described a peculiar feature of the mantle of female Epioblasma- an "inner edge" with a spongy interior. This inflatable ridge is small in snuffbox but dramatically developed in riffleshells (see below). We can now see that the function of the structure is to act as a gasket that seals the shell gape after host capture, to reduce leakage of glochidia. This video (2MB) shows the inflation of the mantle gasket or cymapallium. Do many glochidia get to the gills? You bet. Photo at left shows attached glochidia on the gills of a logperch after an encounter with snuffbox. The mussel makes pumping movements as glochidia are released, apparently acting like a bellows to eject the larvae into the fish's mouth and across its gills. This video clip (2 MB) shows the bellows movements at about 4 times normal speed. 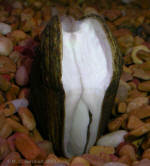 Northern riffleshell females gape widely and the extensive cymapallia, or "mantle pads", extend medially to cover the gape. The wide gape allows fish to be caught well behind the head, or even completely engulfed if small. What happens next is cruel and unusual... In this video clip (5 MB), a lightly anaesthetized darter is dropped into the gape. 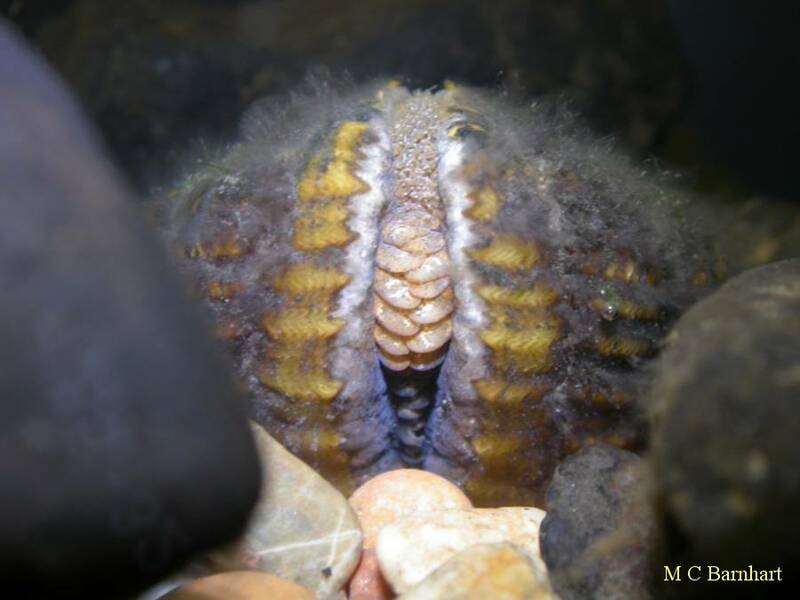 The mussel inflates the mantle pads, which nearly suffocate the fish. When the fish ceases struggling, the mussel retracts the pads and cradles the fish while it recovers, gasping and inhaling glochidia. Such finesse! This capture strategy may facilitate use of a wider range of hosts than the “snout-grabbing” of snuffbox. Although denticles are lacking, the posterior shell edge of female Northern riffleshell is modified by being greatly expanded and turned inward. The edge appears to be well-adapted to catch on the scales of captured fish. Examination of the shell edges of females of other Epioblasma species, including museum shells of extinct species, may reveal clues as to their host-capture habits. Extracting glochidia: As Morpheus said, this will seem a little weird. Removing glochidia from snuffbox for propagation has always been difficult because of their small size and the relatively inaccessible position of the marsupial gills within the shell. 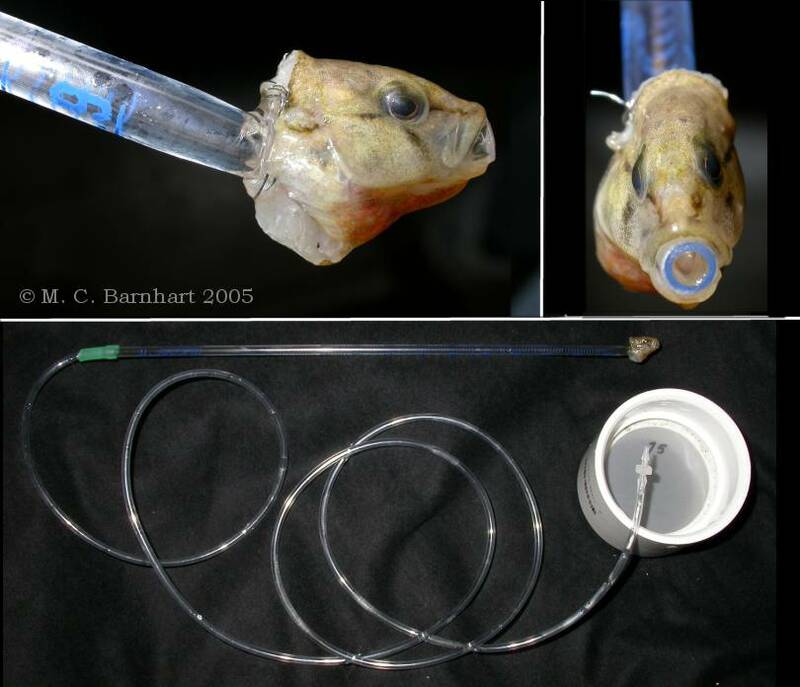 Nowadays, we induce glochidia release with a darter head attached to a pipette. The pipette is connected to a siphon tube and filter cup (collage at left). Here is a video clip (1.2 MB) showing glochidia entering the pipette. Even as we discover their secrets, these amazing mussels are being lost. The genus Epioblasma included 25 species & subspecies, and is the 4th largest genus of North American mussels. However, more than half of these are extinct and many others are endangered. At left is the last known living specimen of Epioblasma florentina curtisii, a male found in the Little Black River, Ripley Co. MO. in 1993. Photo by Paul McKenzie, U.S. Fish and Wildlife Service. “In the female of T. perplexa rangiana, the inner edge of the mantle is posteriorly, in front of the branchial opening, widely separated from the outer edge, and approaches the latter again at about the middle of the ventral margin. In the space between the two edges, the margin of the mantle is thick, white and spongy and of a peculiar structure. Thus the inner edges cut off in part a separate chamber within the shell at the posterior lower end of the latter." Unio Gallery— Home Page http://unionid.missouristate.edu. Copyright 1998-2006 by M. C. Barnhart. Please see Usage Policy for conditions of use of images and video.